Cornelius Coffey was the first African American to establish an aeronautical school in the United States. His school was also the only non-university affiliated aviation program to become part of the Civilian Pilot Training Program (CPTP). His pioneering efforts led to the integration of African American pilots into the American aviation industry. Cornelius Robinson Coffey was born in Newport, Arkansas on September 6, 1903. In 1916, when he was 13, Coffey’s first airplane ride sparked his interest in aviation. Nine years later, in 1925, Coffey left Arkansas for Chicago, Illinois, to study auto mechanics. Soon after he arrived, Coffey and another African American, John C. Robinson, founded the Challenger’s Air Pilot’s Association to support their attempts to enroll in aviation programs in the Chicago area. At the time African Americans were denied entry into these programs. Engaging in self-education, Coffey and Robinson built a one-seat airplane powered by a motorcycle engine. They then taught themselves to fly. Despite their success they knew that they needed official recognition to get flight licenses. Coffey and Robinson enrolled in the Curtis-Wright School of Aeronautics in 1929 only after filing a lawsuit against the institution for racial discrimination. They entered the aviation mechanics training course and two years later both were among the school’s top graduates. 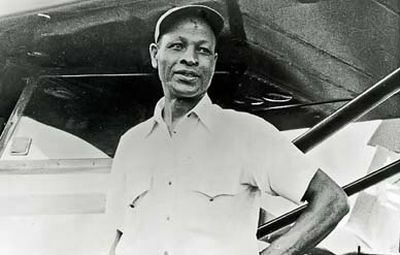 In 1932, Cornelius Coffey became the first African American certified aircraft mechanic in the United States. Later that year Coffey became the first African American to hold both a pilot’s license and a mechanics license. In 1938, Coffey established the first African American-owned and certified flight school. The Coffey School of Aeronautics was located at Harlem Airport in Oaklawn, Illinois, a Chicago suburb. Coffey recruited Clyde Hampton, Willa Brown — a former student who later became his wife — and other pioneer black pilots as instructors. As a consequence, Chicago was considered the leading city for black pilot training prior to World War II. Many of the original Tuskegee Airmen got their initial training at the Coffey school. In 1939, Coffey, along with Willa Brown, the first black member of the Civil Air Patrol, and Enoch P. Waters formed the National Airmen’s Association of America. The main goal of this club was to send black aviators to the military and to expose African Americans and other people of color to aviation. This goal was later partly realized when the Tuskegee Airmen unit was formed by the U.S. Army in July 1941. Coffey, however, was opposed to the Tuskegee program because the black pilots were relegated to a racially segregated unit. Cornelius Coffey was the first African American to have an aerial navigation intersection named after him by the FAA. In 1980, the Federal Aviation Administration created the "Coffey Fix," a waypoint located on the VICTOR 7 airway over Lake Calumet which continues to provide electronic course guidance to planes landing at Chicago’s Midway Airport. Cornelius Coffey continued to fly until 1992 when he was 89 years old. He died on March 2, 1994 in Chicago, Illinois at the age of 91.